Searching for a job? The unemployment rate is still at an all-time high, so perhaps Stack Overflow can help you. The site features a good collection of job postings and tips on how to land the next big opportunity. The other day I fat-fingered iCould instead of iCloud when I was searching for the latest Apple technology release. To my surprise, I discovered a web resource geared toward career advice that features viable tips for job seekers. Watch videos that feature key strategies for job interviews and resume building. If you are LinkedIn user, then you understand the value of building a strong network. Jibe is a new service that connects your LinkedIn and Facebook accounts to jobs. I heard about it from a local career center director. Looking for a tech jobs? Dice.com is a job resource information technology professionals. Post your resume and take control our your career. If you an employer post your position here for the best tech talent. If you are a prospective job hunter, search for a job, read the career news and join in discussions. Looking for a job? Have you considered using Twitter? Recently a friend of mine used Twitter solely to land a great job. Below is a video the describes the most effective way to use Twitter to land a new position. The job scene is changing rapidly in front of our eyes and MTV gives us a shining example of the changing landscape. I was watching MTV and Sway did a segment on hiring a social media manager. If you are looking for a job inspired by this millennium, explore MTV Networks Job Twitter feed or their career website. Are you looking for a job? Are you using social media? If you are using social media then you need to be careful what you say, confirm you’re on the right networks and clean-up your digital presence. If you are not using social media, then you need to start using it to your advantage. Below are three tips to use social media to land a job. Do you have that old MySpace account you never use? Are you there strange pictures on your Facebook page you’ve posted? I suggest if you clean-up anything that may raise any eye-brow by a potential employer. The top four networks are Facebook, Twitter, MySpace and LinkedIn. If you are not on LinkedIn, sign-up and start make connections. You would be surprised how you may be able to connect to future employers. You may think because your conversations are protected behind privacy control but the reality is there are ways for potential employers to read your posts. I have heard where employers setup hidden accounts, get you to accept, and then read your posts. Just remember, you should speak as if your mom was listening. Get Job Fox Working for You! The unemployment rate is at an all time high and the finding a job takes work, but now a new tool is here to help. Job Fox is a new free online job automated job matching and connection site. In three steps give yourself another step forward of scoring a top position. A friend of mine setup her profile and had success landing a career with this service so I thought it would be worth a mention. Recently I got an email from MySpace that they’ve added new features to their website. The trend recently is that MySpace has been on the downturn because other social networking platforms like Facebook are gaining popularity. Thus, I wasn’t surprised when I heard that MySpace was trying to stay relevant. 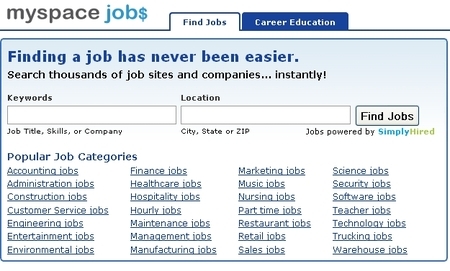 So why not add a job board to your website when the economy is down? The MySpace job portal in my analysis seems to be nothing more than one big refined Google search. The page layout and the actual results for same key terms are similar in Google and MySpace Jobs. The site does however feature a few videos that are strong in helping you land a new job. It also has a tab if you are looking to go back to school, you can search for a higher degree. MySpace has added a new “Job” feature to their website, but it’s really just repositioning technology from Google. The bottom-line is that as long it’s a benefit for the users, it’s a benefit to the site.